I’ve been a backpack guy for years now but recently decided to see how the other half lives. I found a great deal on a roller and took it for a spin (see what I did there?) to compare the two styles of travel. The ease of getting around the airports with a roller was amazing. I would recommend finding a roller that has compartments to secure various items or getting a GridIt system to keep your small items from floating around within. Proximity would be my biggest plus for the backpack. Exhibit A: If you’re in a window seat and you forgot your charger in your bag, you have to climb over one to two people to get to your roller in the overhead bin. If it’s in a backpack by your feet… well, then you just reach down and grab your charger. So how did this death match pan out? Easy to compartmentalize your gear. Gear stays close throughout the trip. You’ll never have to check a backpack. Can get heavy, stress the shoulders/neck. Space vs weight – the more space and stuff you carry, the more stress on the shoulders. Wrinkled shirts on the shoulders. Less physical stress, especially on European connections where you have to walk quite a ways and go through several checkpoints to get to your terminal. More room inside than a backpack. You feel more like an adult. If you’re confronted with a lack of overhead space, you’ll be forced to check the roller at the gate, which means digging all your vitals out of it first. Airport bathroom stalls are small as it is. Try hanging it from a stall hook or finding space inside – yikes. Don’t typically handle well on European cobblestone or third world streets. If you’re already checking a bag I would stick to the backpack as carry-on. If I’m taking a business trip and not checking bags, I would take the roller plus a small pack for personal items. 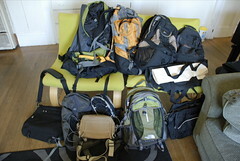 I pack light as it is – on a solo vacation you’d have a hard time seeing me with more than a backpack. What do you take for vacation? For business? I’d love to hear about your favorite backpack or roller! My usual luggage is a roller (carry-on sized) and a backpack, unless I’m travelling for more than a week or have to take some gear. Regardless, the essentials are in the backpack for exactly the reasons you pointed out – close at hand and never checked. Despite the weight, I actually prefer the backpack – easier to navigate.